The Office of Management and Budget is shutting down all congressional travel using government aircraft until the government reopens. The moves comes a day after President Trump revealed that House Speaker Nancy Pelosi was leading a congressional delegation (known as CODEL) to Brussels and Afghanistan and forbade her from using government transportation to travel. 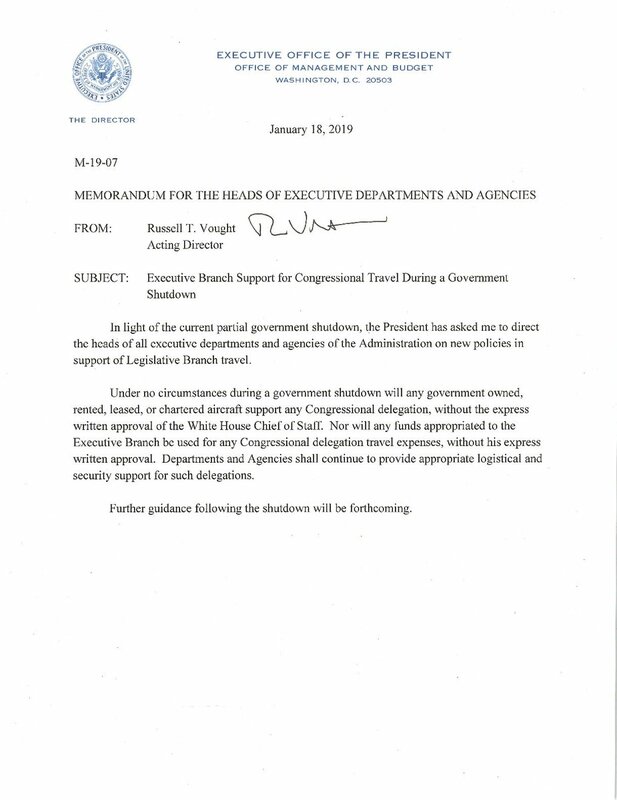 "Under no circumstances during a government shutdown will any government owned, rented, leased, or chartered aircraft support any congressional delegation, without the express written approval of the White House chief of staff," Acting OMB Director Russell Vought wrote in a memorandum to the heads of executive departments and agencies.